Butter Chicken, or Murgh Makhani, is a classic Indian chicken recipe made with tender juicy chicken pieces cooked in creamy, mildly spiced tomato sauce. Made with simple, straightforward ingredients, preparing your own Butter Chicken Recipe right at home is easy and economical. Often confused with Chicken Tikka Masala, Butter Chicken is rich, flavorful, and one of the most popular recipes you can order from an Indian restaurant. Made with tender chicken thighs, mild spices, butter, and cream, it’s hard to resist this east one-pot chicken dinner. Butter Chicken is one of my top five favorite Indian recipes. 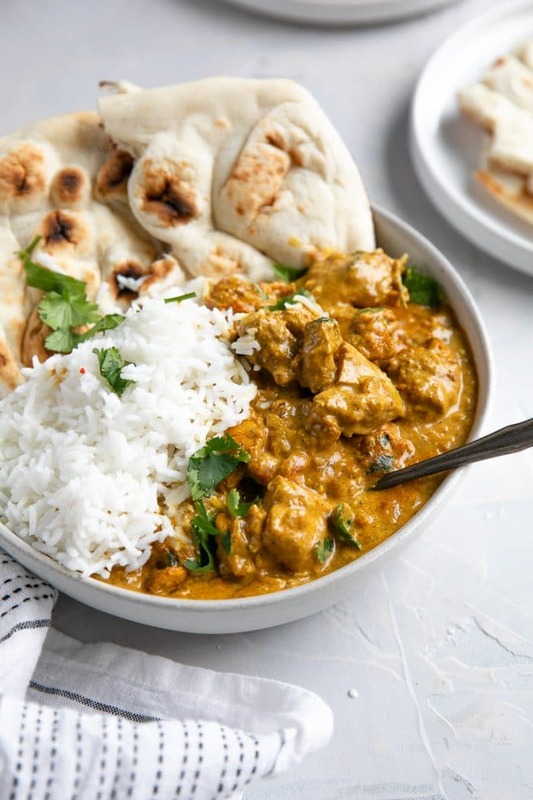 Creamy, delicately spiced, and loaded with tender, juicy pieces of chicken, it is literally impossible to resist this fan-favorite Indian curry. 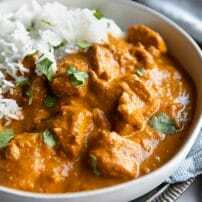 Butter chicken is the perfect introductory dish for anyone new to Indian spices and flavors as it is easily modified to be more or less spicy depending on personal preference. 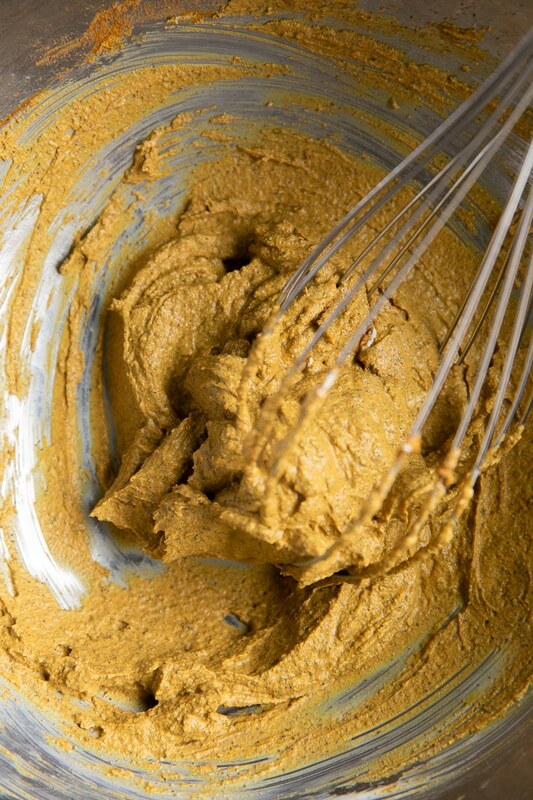 Kids (yes, even my 5-year-old) love the rich and buttery curry sauce. 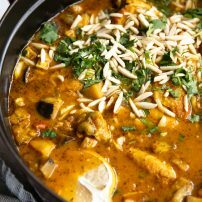 Traditionally served with rice, Murgh Makhani is meant to be eaten with your hands rather than utensils by scooping up chunks of chicken and sauce in soft torn off pieces of naan bread or chapati (this may or may not be my 5-year-olds favorite part). 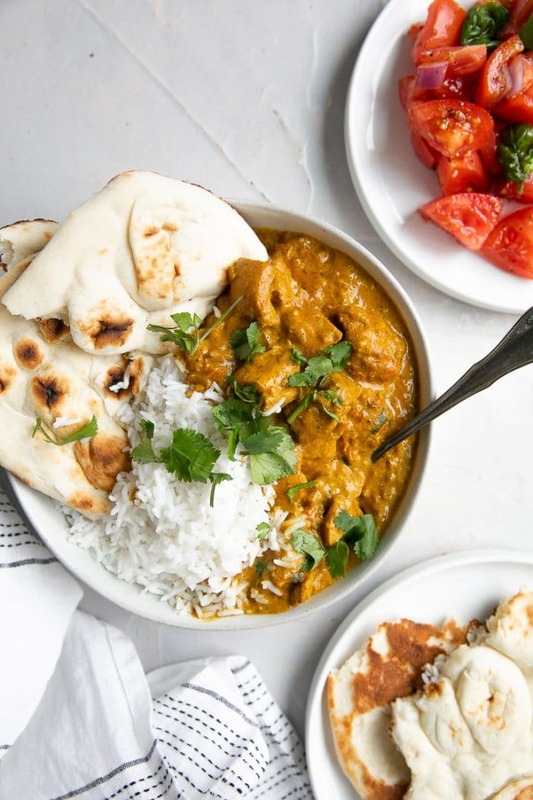 No matter how you choose to enjoy Butter Chicken, this easy and flavorful Indian chicken is guaranteed to be an instant family favorite. Some of you may be curious why Butter Chicken is called Butter Chicken? After all, when I first heard about this dish I expected a chicken literally swimming in butter. While there is butter in this dish, there’s a whole lot more to it. 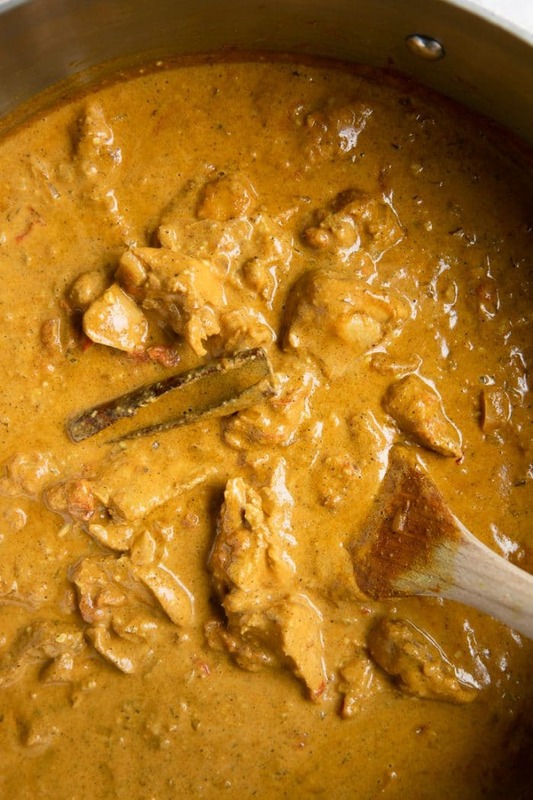 Butter Chicken, also known as Murgh Makani, translates literally to chicken with butter. Very similar to British invented Chicken Tikka Masala, each of these popular chicken dishes are rich, creamy, and are prepared in a similar way. Created in the 1950s, Butter Chicken was created by three Punjabi Hindu Indians who were the founders of the restaurant, Moti Mahal in Delhi. The dish was made when leftover chicken was mixed in a tomato gravy that was rich in butter and cream. You may be surprised to learn that there aren’t a lot of differences between butter chicken and chicken tikka masala. The first, and most important is that Chicken Tikka Masala typically has an overall greater amount of spices. 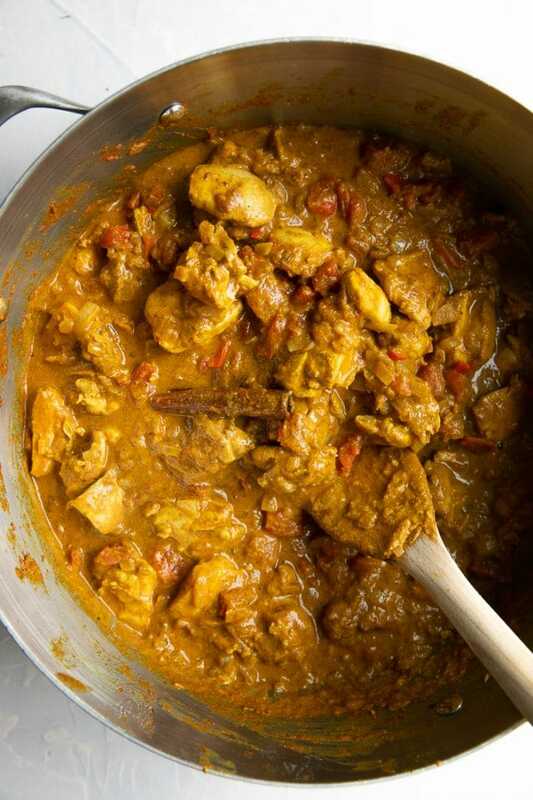 This leads to a brighter, more complex, and more spice-flavored curry sauce. Another difference is the amount of butter. Now, Tikka Masala does include butter, but not as much (about half as much), so there’s that. And then there’s the difference in origin. 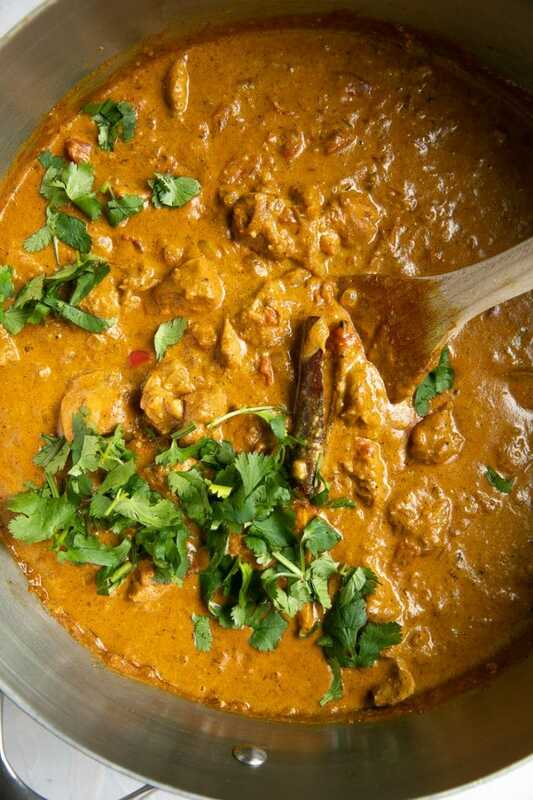 Butter Chicken was founded in India, while Chicken Tikka Masala was created in the UK. There are two parts to this recipe- the marinade and everything else. The marinade is extremely important. It’s where all the spices are and your chicken will hang out for at least a couple hours (longer if you have the time). Do you know how in some recipes you can skip the marinade? You can’t do that here. Chicken. I made this recipe using chicken thighs. I know some of you prefer breast meat, and that would work totally fine, however for the very best flavor, go with dark meat. You do not need to leave the skin on. That would be overkill. Plain full-fat yogurt. It doesn’t really matter what kind of yogurt you use as long as it’s plain, unsweetened, and, full-fat. 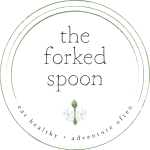 Yogurt is the ultimate meat tenderizer and will also play a critical part in the overall taste of the sauce. Fresh lemon juice. Please use fresh lemon juice, not the concentrated kind. Turmeric. Turmeric is a bright orangish-yellow spice popular in many Asian dishes. It has an earthy aroma and gives a somewhat bitter flavor to foods. Garam Masala. Garam Masala is actually a blend of spices including black pepper, mace, cinnamon, cloves, brown cardamom, nutmeg, and green cardamom. The garam masala blends will differ between brands and region, but this is one that I recommend. Ground Cumin. A staple in much of Indian cooking, cumin gives an earthy, warming, somewhat peppery character to food. Salt. Just a pinch or so. Butter. I’m a big fan of salted butter. If you’re watching your sodium intake, however, use unsalted butter. Yellow onions. Yellow onions are my top pick for this butter chicken recipe since they’re the mildest. Fresh garlic. Fresh is best. Fresh ginger. Like garlic, fresh ginger has the best flavor. I typically use a Microplane to grate mine. Cumin seeds. Completely different flavor from ground cumin. I do not recommend substituting with ground cumin as it will change the overall taste of the dish. Cinnamon Stick. The whole stick, not powder. Diced tomatoes. I added one 28-ounce can of tomatoes. You may add more if desired, just add additional time to allow the water to simmer off before adding the cream. Red chili powder (not cayenne). Most red chili powder is not spicy. However, if you or your family are super sensitive to spicy foods, start with less or omit completely. Broth. I added low-sodium chicken broth. You may also use veggie broth or water. Cream. Yes, the full-fat kind. You can use half-and-half, but it will not taste as rich and luxurious. Tomato paste. Just a couple tablespoons to thicken up the sauce. Ground cashews. Ground cashews are often added to sauces and curries to help thicken them up. If your sauce is already super thick or you’re not a fan of cashews, feel free to skip them. Fresh cilantro. I love cilantro so I always sprinkle a little fresh cilantro on top of my Butter Chicken. This is optional. 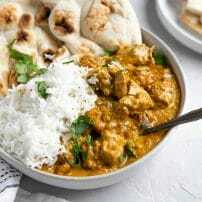 Traditionally, Butter Chicken is made by marinating chunks of chicken for several hours in a spice-filled yogurt sauce and then grilled or cooked in a tandoor (traditional clay oven) to make beautiful, smoky, delicious chunks of chicken. Since I do not have a tandoor or red hot coals just chilling outside my house waiting to be used, I prepared this recipe in my favorite, go-to, Dutch oven. 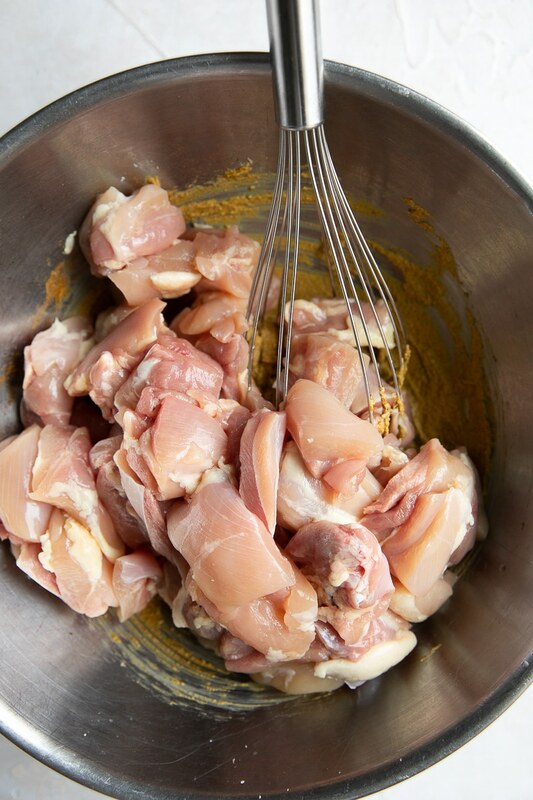 You may grill, roast, or pan-fry your chicken, or simply add it to the simmering curry sauce- totally up to you. So, chicken breasts or thighs? Butter Chicken is traditionally made with chicken thighs. Chicken thighs, unless you have access to a tandoor, will give the best flavor and texture. You may absolutely use chicken breasts if you prefer, but I highly recommend marinating the chicken for at least overnight for best flavor. 1 | Marinate your Chicken. 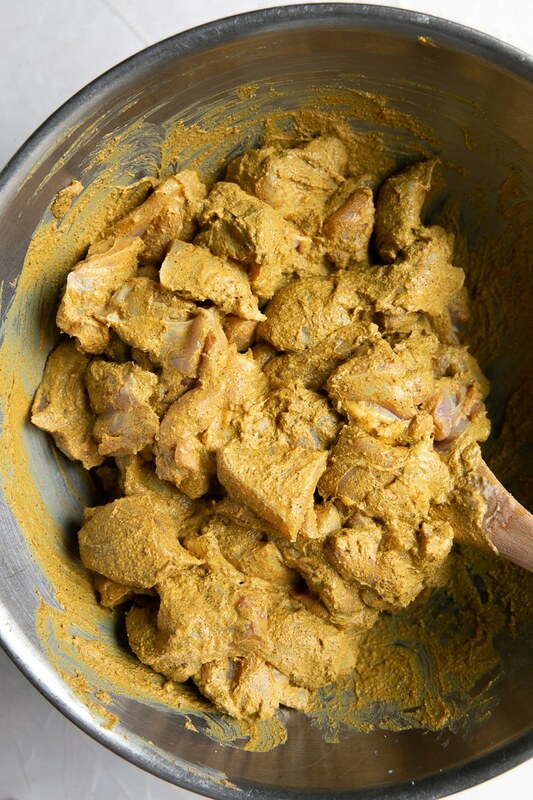 The first part of making Butter Chicken is getting your chicken chopped into chunks and marinated. This step is essential to the overall taste and flavor of this wonderful dish, so please, don’t skip it – even if you only have enough time to marinate the chicken for 30 minutes or so. 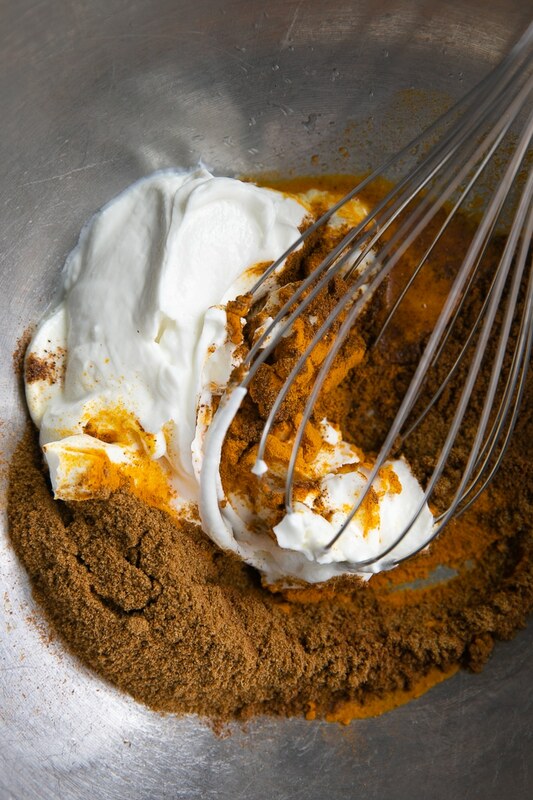 To do this, simply add all your marinade ingredients (yogurt, lemon juice, turmeric, garam masala, ground cumin, and salt) to a large mixing bowl and whisk well to combine. Add your chicken pieces and mix well to coat. You may marinate your chicken up to three days ahead of time. Simply add to a container with a tight-fitting lid and keep stored in the refrigerator until ready to cook. When you’re ready to begin cooking, grab a large heavy-bottomed Dutch oven. This is my favorite, go-to, Dutch oven that I use in tons of cooking. Set your pot over medium-high heat. Once the pan is nice and hot, and the oil and butter. Allow the butter to melt completely before adding the onions. I highly recommend that you dice your onions as small as possible- especially if you don’t plan on blending the sauce in a blender (more on that in a bit). You may also grate your onion using a cheese grater, just take care not to get your fingers. 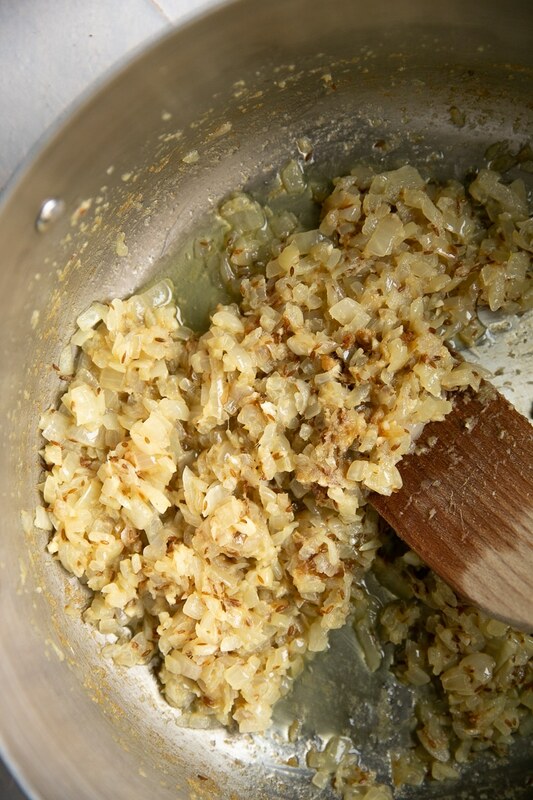 Once the onions turn translucent and start to brown a bit, add the garlic, ginger, and cumin seeds. Mix well to combine and continue to cook, stirring often, for an additional 3-4 minutes. Reduce heat if needed to prevent the onions from burning. Now, add the cinnamon stick, diced (or crushed) tomatoes, red chili powder (if using) and salt. Mix well and allow mixture to simmer for approximately 10 minutes over medium-low heat. If you added extra tomatoes, you may need to simmer a few extra minutes. No biggie. Optional: Blend the tomatoes and onions? You guys have the option to leave the sauce somewhat chunkier or blend it all together in a blender. This is entirely up to you. I didn’t blend mine. At least not this time. When I made my Chicken Tikka Masala, I did. 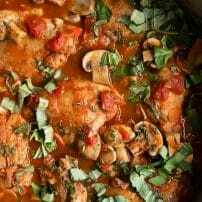 But for this Butter Chicken Recipe, I decided to chop everything as fine as possible and let the slow simmering do the job of breaking everything down and mixing it together. Again, options. We like options. Remember all those spices that we into the marinade? Ya, we want those. So what you’re going to do is increase the heat to medium-high and add the chicken plus ALL the marinade to the simmering tomatoes and onion. Mix well to combine. Cook the chicken for 8-10 minutes, stirring often. Reduce heat to medium if the tomatoes start to burn. With the chicken in the pot and cooking, the sauce should be wonderfully fragrant and bright yellowish orange. Stir in the chicken broth and bring to a gentle boil. Once at a boil, immediately reduce heat to low, cover, and simmer for at least 20 minutes, stirring occasionally. Remove the lid, and continue to simmer for an additional 20-25 minutes, stirring often. By this point, the chicken will be cooked and the sauce should be thick. The onions and tomatoes should have dissolved into smaller and smaller bits and pieces. It is finally time to add the cream, tomato paste, and ground cashews. Mix well to combine and allow to simmer for an additional 5-10 minutes. Season with salt, pepper, or a dash or cayenne pepper, if desired. That’s it, you guys! Phew, I’m hungry. 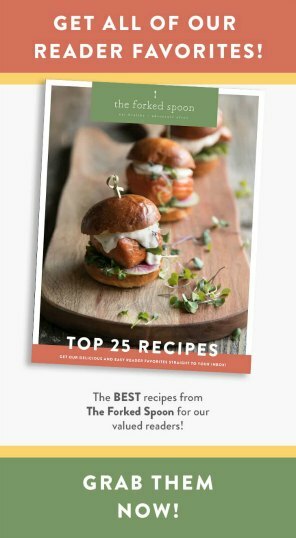 I know, it seems like a lot, but I basically just wrote out everything I would have said if I were about to host a live cooking show, so at least you know you have all the info! Mild or spicy? Depending on your heat tolerance, you may choose to make Butter Chicken either mild or spicy. 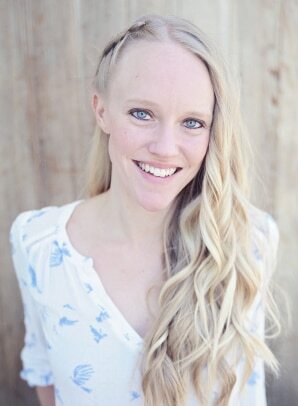 In this case, I chose to keep it mild because it’s one of Octavian’s favorites. However, add 1/2 or more teaspoons of cayenne powder to kick it up a notch. If you prefer a thicker sauce, add more ground cashews to the sauce at the same time that you added the tomato puree. The leftovers are AMAZING so definitely hold on to those and enjoy all week long! Does Butter Chicken reheat well? Yes! Just like this Thai Red Curry, this creamy chicken curry reheats super well on the stove or in the microwave. Can you freeze leftover Butter Chicken? I have never personally tried to freeze this cream-based chicken dish. However, word on the street is that, yes, it tastes just as delicious after being thawed and reheated from frozen. 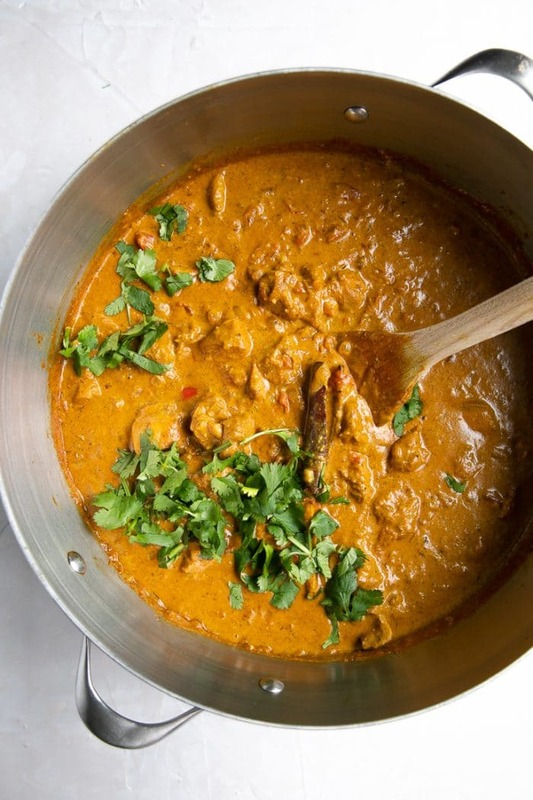 Is Butter Chicken Gluten-free? Yes! If you try making this Butter Chicken Recipe (Murgh Makhani), please leave me a comment and let me know! I always love to hear your thoughts. 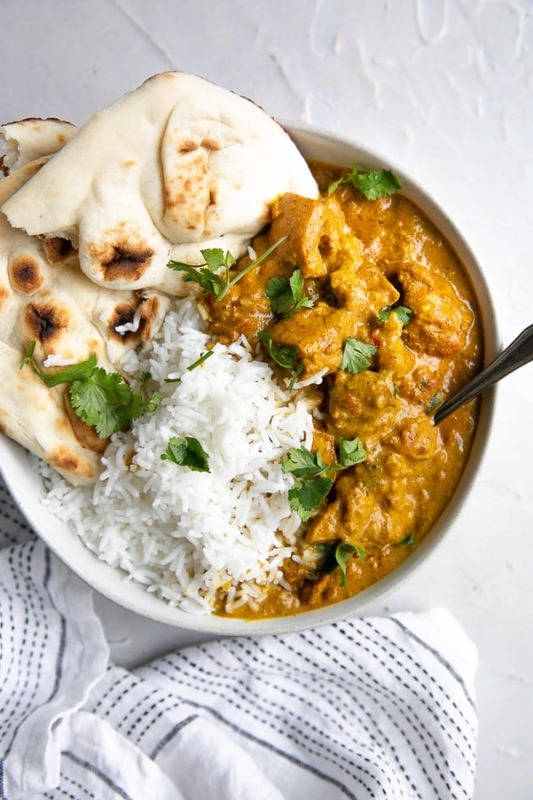 DON’T FORGET TO PIN AND SHARE THIS BUTTER CHICKEN AND ADD IT TO YOUR NEXT WEEKLY MEAL PLAN! Butter Chicken, or Murgh Makhani, is a classic Indian chicken recipe made with tender juicy chicken pieces cooked in creamy, mildly spiced tomato sauce. Heat the oil in a large pan or Dutch oven over medium-high heat. Add the butter and allow it to melt completely. Add the onions and mix well to combine. Sauté for 4-5 minutes, or until starting to soften and turn translucent. Add the garlic, ginger, and cumin seeds to the pot. Continue to cook until the onions start to brown, approximately 3-5 minutes. Stir often. Mix in the cinnamon stick, tomatoes, red chili powder, and salt with the onions. Reduce heat to medium-low and allow mixture to simmer for 5-10 minutes, stirring often. 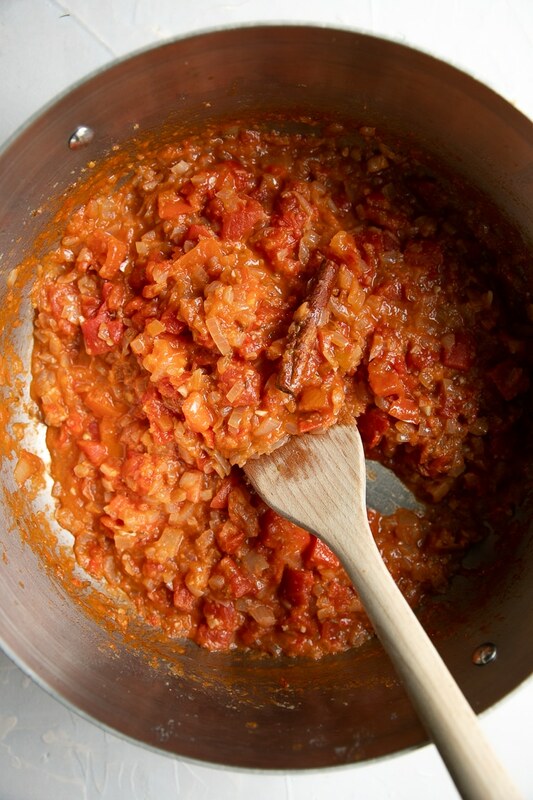 Optional- remove the cinnamon stick and transfer the onion and tomato mixture to a food processor or blender. Process until smooth and creamy then return tomato sauce back to the pot. Increase heat to medium. Add the chicken (plus marinade) to the pan. Mix to combine. Cook the chicken for 10 minutes, stirring often. Stir in the chicken broth and bring to a gentle boil. Reduce heat to low and simmer for at least 30-45 minutes, stirring occasionally. Mix in the cream, tomato paste, and ground cashews. Allow the curry to simmer for an additional 5-10 minutes. Season with salt and pepper, to taste and garnish with fresh cilantro if desired.